Spectra, visibilities, differential phases and closure phase for each baseline observation, of the Brγ line (left) and high-n Pfund lines (right) for HD 50138. The dashed lines correspond to the systemic velocities of the lines. Flux is normalized to the continuum. Credit: Koutoulaki et al., 2018. Using European Southern Observatory's Very Large Telescope (VLT) European astronomers have uncovered a complex circumstellar environment of the star HD 50138. The finding, which could provide important clues about the evolutionary status of this star, was presented in a paper published May 3 on the arXiv pre-print repository. Located some 1,100 light years away from the Earth, HD 50138 is a Herbig Be star of spectral type B8, about seven times larger and six times more massive than our sun. With a lumonisity of approximately 1,000 solar luminosities, it is one of the brightest Be stars in the southern sky. The evolutionary status of HD 50138 is still unclear. Some astronomers suggests that it as a pre-main sequence star, while others propose that it should be considered as an evolved object close to turn-off from the main sequence. Moreover, it is also not clear whether HD 50138 is part of the Orion Monoceros molecular cloud complex or not associated with any star-forming region. Determining such a possible association could provide additional hints of the age of this star. In order to learn more insights into the nature of HD 50138, a team of researchers led by Maria Koutoulaki of the Dublin Institute for Advanced Studies in Dublin, Ireland, conducted near-infrared interferometric observations of the innermost circumstellar environment of this star. For this purpose they employed the VLT-Interferometer (VLTI) with the beam combiner AMBER (Astronomical Multi-BEam combineR). This instrument allowed the scientists to find that the star's circumstellar environment is very complex. 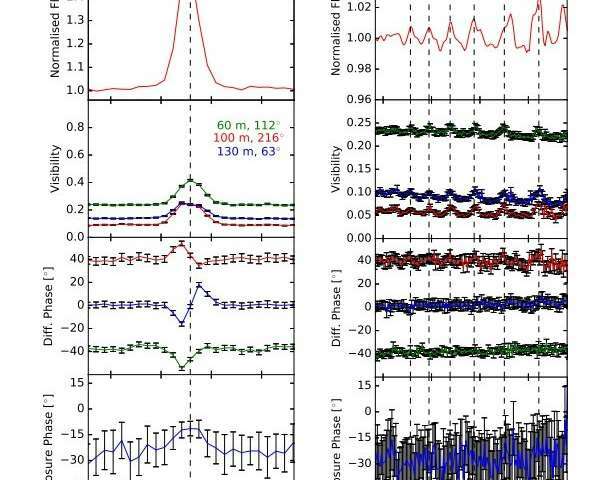 "We report observations of the Herbig B[e] star, HD 50138, using VLTI/AMBER interferometric observations in the K band at medium spectral resolution. (…) Our results reveal that the circumstellar environment is very complex," the researchers wrote in the paper. Study unveils that the spectrum of HD 50138 shows continuum emission, as well as hydrogen emission lines of bright Brackett-gamma and faint high-n Pfund. The researchers underlined that this in contrast to previous studies that detected only continuum and Brackett-gamma line emission. "Our observations allowed us to map the size of the continuum emission and of the Brγ and high-n Pfund lines. The latter is detected for the first time," the paper reads. The researchers estimated that the region of continuum emission has a projected size between 0.6 and 1.0 AU. When it comes to hydrogen lines, the projected size is about 0.4 AU. Moreover, they noted that both continuum and Brackett-gamma lines were found to trace an asymmetric origin but with opposing directions of asymmetries. In concluding remarks, the astronomers wrote that results regarding continuum and hydrogen lines, including morphology of the emission regions indicate complex circumstellar environment of HD 50138. They added that their findings also suggest that the studied object is most likely an evolved star. "Finally, although we cannot exclude the possibility that HD 50138 is a young star our results point to an evolved source," the researchers concluded. HD50138 is a Herbig B[e] star with a circumstellar disc detected at IR and mm wavelength. Its brightness makes it a good candidate for NIR interferometry observations. We aim to resolve, spatially and spectrally, the continuum and hydrogen emission lines in the 2.12-2.47 micron region, to shed light on the immediate circumstellar environment of the star. VLTI/AMBER K-band observations provide spectra, visibilities, differential phases, and closure phases along three long baselines for the continuum, and HI emission in Brγ and five high-n Pfund lines. By computing the pure-line visibilities, we derive the angular size of the different line-emitting regions. A simple LTE model was created to constrain the physical conditions of HI emitting region. The continuum region cannot be reproduced by a geometrical 2D elongated Gaussian fitting model. We estimate the size of the region to be 1 au. We find the Brγ and Pfund lines come from a more compact region of size 0.4 au. The Brγ line exhibits an S-shaped differential phase, indicative of rotation. The continuum and Brγ line closure phase show offsets of ∼-25±5o and 20±10o, respectively. This is evidence of an asymmetry in their origin, but with opposing directions. We find that we cannot converge on constraints for the HI physical parameters without a more detailed model. Our analysis reveals that HD50138 hosts a complex circumstellar environment. Its continuum emission cannot be reproduced by a simple disc brightness distribution. Similarly, several components must be evoked to reproduce the interferometric observables within the Brγ, line. Combining the spectroscopic and interferometric data of the Brγ and Pfund lines favours an origin in a wind region with a large opening angle. Finally, our results point to an evolved source.